NEW! Lennar Homes Gulf Coast Series, ''SanLuis'' Plan with Brick Elevation ''B" in Beautiful Tavola! Inviting Single Story with 4 Beds/2 Baths/2 Car Garage! Foyer opens to roomy Living/Family Room! Amazing Kitchen w/ 36'' Designer Cabinets, Granite Countertops, Breakfast/Dining Area, & Great Stainless Appliance Pkg! 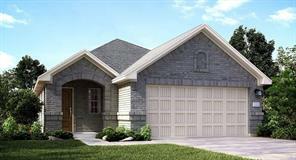 Master Bedroom has Master Bath with Dual sinks, separate Tub & Shower, Walk-in Closet! Lovely Ceramic Tile Flooring. 2'' Faux Wood Blinds; Walk-in Utility Room! 9'x14' Patio Option, Fully Sodded Yard, Landscape Pkg ! Energy Efficient w/ 16 SEER HVAC System, Radiant Barrier roof Decking & MORE! This home is a Wi-Fi CERTIFIED smart home featuring integrated automation and voice control with Amazon Alexa!